Remember that Basquill branch I’ve been working on in Ontario? And I couldn’t figure out what had happened to Bridget, the daughter of Patrick Basquill and Ellen Cannon/Gannon? But I knew she could not be the Bridget Basquill who emigrated to the US, settled in Chicago, and married Thomas Raycraft? Onna counta that Bridget Basquill was mentioned in her father’s will, and her father’s name was William, not Patrick? And it wasn’t just a name variation, but an impossibility that William and Patrick were the same person, because Patrick died and was buried in Canada, long before William died and was buried in Chicago? I looked at the Ancestry user trees for Bridget who married Thomas Raycraft/Raycroft, all of which either have no parents listed or the incorrect Patrick Basquill and Ellen [with no last name]. And then I realized something else these user trees got wrong. Several of them have Bridget’s middle name listed as Catherine. There was a Bridget Catherine Basquill in the Chicago area, but she was much younger than the two Bridgets I’m chasing. I think someone assumed the Bridget who married Thomas Raycraft must be the same Bridget who was also named Catherine. Nope, nope, nope. But, that led me to re-examine the documents I *did* have for Bridget, daughter of Patrick and Ellen. In the 1861 Canada census, she’s listed as Tresa. O rly, I said? So I started looking for Theresas who were born in Canada but emigrated to the US, and I found a Theresa Basquille in the 1883 Madison, Wisconsin city directory. Huzzah! But is it the Bridget Theresa I’m looking for? I think it is, y’all! I found a marriage index entry for her, on Ancestry, for 26 May 1887 in Milwaukee, Wisconsin. No idea who she married, so I then searched the same index for marriages on that exact date, and I got a list of 17 individuals. Not bad, and definitely something I can work backwards from. So then I started searching the 1900 census in Wisconsin for a T*eresa born in Canada between 1845 and 1855 (there effectively is no 1890 US census, so 1900 is the first census she’d appear in with her married name). And then I compared that list to the list of folks married on the date Theresa was married, and I found a match. Frank Shipman, married to Theresa, who was born in Canada in 1856, married in 1887. So then I went to Family Search, because they have collections Ancestry does not have, and those records have also been indexed independently with new and even more exciting transcriber misspellings and mistakes. 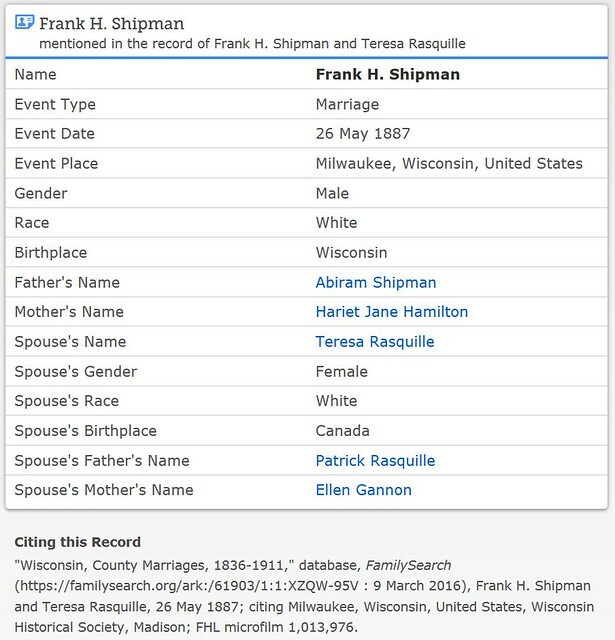 I found a marriage record there for a Frank H. Shipman to a Teresa Rasquille born in Canada whose parents were Patrick Rasquille and Ellen Gannon. The original image is not available, just the index, but gee, that looks like Patrick Basquille and Ellen Cannon, doesn’t it? I am ridiculously excited and happy to have figured this out.